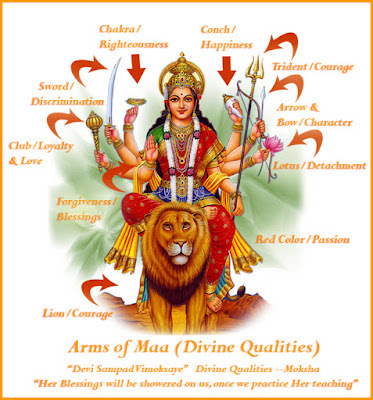 Healings Forever: Heal Your Life with Navarn Mantra on Nava Ratri " Om Aim Hreem Kleem Chamundaye Vichhey"
Heal Your Life with Navarn Mantra on Nava Ratri " Om Aim Hreem Kleem Chamundaye Vichhey"
Today is the first day of Nava Ratri. 9 Nights devoted the various forms of Goddess Durga hence called Durga Puja. This is an opportunity for 9 Days&Nights of invoking 'Shakti' or power within! Navarn 'Mantra' || Om Aim Hreem Kleem Chamundaye Vichhey || is widely used during these days for the devotion to the female energies of existence. "The word mantra has two parts: man, which is the root of the Sanskrit word for mind; and tra, which is the root of the word instrument. A mantra is therefore an instrument of the mind, a powerful sound or vibration that you can use to enter a deep state of meditation." Mantras are 'Linguistic Audio Tools' developed in Vedic langauge, Sanskrit, for altering the vibration and energy of the physical 'Brain' as well as ' Mind' resulting in the alteration of 'Chetna' - the conscious awareness of existence. These are easy to use mind tools which are considered sacred in India since ancient times till date. Navarn mantra is a very power tool for improving the Auric Energy & Charkas. The mantra empowers user with the power to enhance positive energy and remove the negative influences. Navarn Mantra energizes nine Chakras including all seven major chakras worked upon in Yogic & Modern Energy healing Systems. Chamundaye : Widely worshiped form of ferocious energy, the slayer of Chanda and Munda, two powerful fearsome devils | Another meaning - one who is always moving (cha) in the head or thoughts (Mundaye). Meditating upon the mantra and chanting mantra using "108 bead Malaa (Rosary)" is a widely accepted practice during 'Nav Raatri' ! Here's a good depiction of Energy Representations of 'Shakti' - Godess Durga. Shakti translated to English is energy/power.